My aim is always to create a calm, contented relationship between dog and owner, thus ensuring a happier existence for all concerned. The first Consultation is FREE. 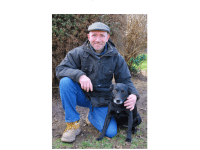 My name is Simon Taylor, and I have had dogs in my life for over 40 years. I have developed an affinity with dogs which, combined with love, has allowed me to develop my behavioural training techniques. 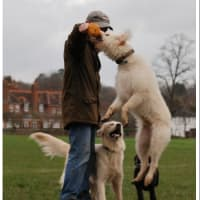 My dog and owner training technique is a kind, simple and very effective system, based on three basic principles. Exercise, understanding and effective communication. It is essential to involve all members of your family in this process to ensure its effectivness. It is as important to work with the owner in learning my methods as it is with the dog. The results can be astonishing and often come very quickly, sometimes immediately. My methods are successful in correcting all manner of unacceptable canine behaviour, including aggression, barking, jumping up, mounting, pulling on the lead, recall and food obsession, and always prove to be successful. My aim is always to create a calm, contented relationship between dog and owner, thus ensuring a happier existence for all concerned. Simon has a unique approach to training, he trains the owner. I have a small but dominant dog who like many small dogs is seen first for their looks. She showed extreme fear on a lead and was hard to handle. I was useless... Simon showed me how to walk holding the lead in a relaxed way. He walked with me guiding and relaxing me. His techniques are informed, evidenced and caring. Dogs adore him. He has shown me how to stimulate my dog by 'search & find feeding' 'Agility in the back garden and much more. Simon helped with me with training my German Pointer. I use the insights every day and have seen real improvements in behaviour.